Sticks and stones aren’t for breaking bones, if you're a penguin. They're symbols of love. Sticks adorn the nests where they raise their children, and stones serve as heartfelt gifts from one bird to another. Different breeds of penguins meet and mate in wildly different climates around the world, but they all share the same relationship goal: making more penguins. Humans give flowers and candy when wooing a lady. Penguins give rocks. Not just any rocks, though -- male gentoo penguins search through piles of pebbles to find the smoothest, most perfect ones. When a penguin has selected his pebble, he presents it to his intended companion. If she approves, she puts the stone in her nest and the two are well on their way to becoming mommy and daddy birds. Pebbles are so important to the penguins that males often fight over the prettiest selections. Penguins don’t need soft music and candles to set the scene for romance. They breed in some of the harshest conditions in the world. 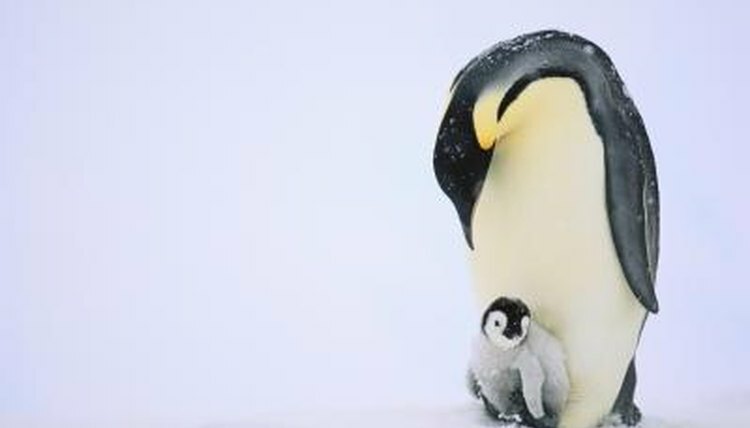 Emperor penguins get their groove on during winter in Antarctica, trekking inland on solid ice. The winter is so cold, at more than 50 degrees below zero, that parents have to perch the eggs on their feet constantly so they don’t freeze. Humboldt penguins have the ickiest place to mate. They breed in burrows sometimes made of guano, aka poop. The Fiordland species, which lives in the rainforests of New Zealand, has a comparatively posh baby-making environment. Its birds breed in caves or under rocks in nests of scavenged sticks and grass. Macaroni penguins aren’t terribly picky about where they set up camp. Most dig out a modest nest, but many lay their eggs in the open on a flat rock. Sadly, one of the two eggs each mother lays typically dies. True love waits -- for a little while, anyway. Penguin breeds including gentoo, chinstrap and Adelie mate with the same partner year after year. If a partner doesn’t show up, the show must go on; most birds will choose another mate. Monogamy isn’t for all penguins, though. Occasionally, a penguin will choose two or three partners in a year.